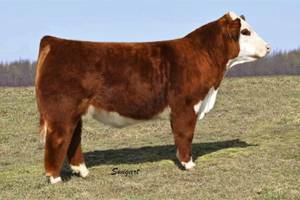 Exceed offers the complete package that the Hereford breed is seeking. He is massively constructed, big bodied, sound footed with great eye pigmentation. Tremendous udder quality, fleshing ability, maternal strength and fertility are proven characteristics in Exceed’s genetic background. Whether you are a commercial cattleman or a show cattle operation, his muscle mass, structure and built in calving ease make him an easy choice!